Take wheat flour, add salt, 1 teaspoon oil and knead dough. Make 10-12 small balls. Take one ball and roll the roti. Take non-stick tawa and roast the roti on a low flame. It should be lightly roasted, not fully like a roti. Prepare all the tortillas like this. Take a muslin cloth and wrap the tortillas to keep it slightly warm and soft. Take a pan, heat 1 teaspoon oil. Add garlic paste, onions and sauté it for about 2 minutes. Add green chillies, mashed boiled potato, sprouted moong, salt, pepper/garam masala, lemon juice and mix it well. Cook it for 2 more minutes. 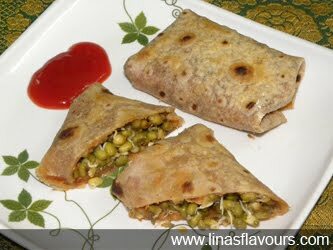 Take one tortilla, spread tomato sauce, moong mix in between and make a roll or wrap from all four sides. Prepare all the burritos like this. Take a baking tray and arrange all the burritos. Slightly brush it with oil. Preheat oven and bake the roll in Microwave+Grill combo at 300W+Grill for 8 minutes or till it turns light brown. Cut into half diagonally and serve it hot with tomato ketchup. You can make tortillas on previous day also. Keep it in the refrigerator and warm it when you cook it. Generally, tortillas are made from corn flour and all purpose flour but I use wheat flour for low fat dishes.